The OREL Foundation | Articles & Essays | More Music for the Kinohalle! More Music for the Kinohalle! The author's principal concern here is to demonstrate the extent of Polish resistance in the face of Nazi oppression, especially in Warsaw and other urban centers of occupied Poland. Given the deprivations, chaos and terror that were an everyday part of Polish civilian life during the war, it is indeed difficult to imagine who would risk the consequences of organizing something as seemingly frivolous as concerts of Polish music. Yet as impressive as this effort on behalf of Polish culture may have been, Poles in fact were composing new music and organizing concerts in dramatically more improbable circumstances than the article's author, in Warsaw, could have known about. In the Nazi concentration camps, the same need to preserve their cultural identity motivated Polish prisoners to engage in some of the most remarkable music-making of the World War II period. Józef Kropiński was among the most prolific composers in the camp system. By narrowly focusing on his activities in Buchenwald, this essay provides not only a glimpse of Polish music during the War, but also a more detailed portrait of music-making within the Nazi camp universe, underscoring the complexity of circumstances that allowed for cultural life to flourish there from the summer of 1943 until the camp's liberation in April 1945. Józef Kropiński was born in Berlin on December 28, 1913, and moved with his family to Bydgoszcz (formerly Prussian Bromberg) after the First World War. 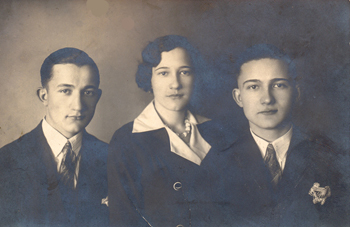 There Kropiński attended a business high school and passed his diploma exam in 1933. Gifted and ambitious, he simultaneously pursued music studies, first at the Leon Jaworski School of Music, then at the Bydgoszcz Music Conservatory, where he studied violin. Kropiński fully participated in the city's fairly sophisticated musical life: he was the organist at his church, gave viola lessons at the Jaworski school and, until 1938, was a member of Jaworski's acclaimed orchestra, which was made up of the school's faculty. Thanks to the wide range of classical music that he performed in public and the more popular pieces with which he and his brother frequently entertained their family at home, Kropiński amassed an impressive repertoire before his father redirected his professional pursuits in December 1938, encouraging him to take a job in the administration of the Polish-French Railway Society. There, Kropiński worked in the coal division, but, unable to abandon music, in a short time he became the assistant conductor of the newly formed Railway Orchestra as well as the director of the Railway choir, "Haslo." His Railway Society responsibilities as well as his year-long military reserve training ultimately prevented him from graduating from the conservatory before the start of the war. Like many young Polish patriots determined to do anything to undermine the Nazis, Kropiński aided in the distribution of anti-fascist leaflets after the occupation, and, on May 7, 1940, he was arrested by the Gestapo on conspiracy charges. After a brutal interrogation followed by over a year in prison, he was sent to Auschwitz on November 27, 1941, and registered as a Polish political prisoner, number 23,468. Kropiński was assigned to an Aussenkommando, or outside work detail, which meant all but certain death for prisoners, especially those who arrived at the camp during the harsh winter months. Early in April 1942, he approached the camp orchestra conductor, Franciszek Nierychło, and asked to audition for the orchestra. (According to Kropiński's son, Waldemar, he often spoke of that audition as the hardest exam of his life.) Despite his weakened physical state and injured hands, Kropiński impressed Nierychło enough to be made a first violinist. He was also appointed copyist for the orchestra. Over the following year, he composed seven short songs in folk-like, religious and lyrical styles, in addition to a march. Four of the songs were settings of poems written by fellow inmate Kazimierz Wójtowicz. Perhaps most importantly, there was the International Camp Committee (ICC). 3 The ICC was an illegal prisoner organization formed in the summer of 1943 through an accord among several covert national communist cells already working in the camp. 4 This highly organized, international communist resistance movement performed acts of sabotage in the arms industry, smuggled weapons into the camp, and saved prisoners from imminent death whenever possible. According to some estimates, the ICC may ultimately have saved thousands of lives. It was in the Pathology Department, in a tiny six-by-five-foot room, that Kropiński created over a hundred original compositions in a wide range of styles and genres, including songs, marches, characteristic pieces, dances, orchestral and piano works, chamber music, an opera, an operetta and nearly four hundred arrangements of already extant music. He composed only at night and by candlelight, often working into the early hours of the morning. This allowed him to retreat from the realities of camp life and to compose music, uninterrupted, for the numerous concerts planned at the camp. Before Kropiński gained this position within the Pathology Department (it was arranged for him toward the end of 1943 by the communist writer Bruno Apitz), Kropiński had managed to create seven short compositions  songs and dances  like the following little waltz melody without words. Your browser doesn’t support HTML5 audio. Here is a link to the audio instead. After Kropiński had been "discovered" by the ICC and had become involved in the organization's cultural undertakings, he achieved the astonishing average of one composition a day until the end of the war. This was accomplished even while Kropiński worked his officially assigned eleven-hour details, first in the Strumfstrickerei (sock-mending unit), then as a gunsmith in the Gustloff Werke munitions factory. Photos of the exterior and interior of the barrack. The first Kinohalle concert was held on August 1, 1943, with an all-classical music program, and between then and the spring of 1945 at least twenty-seven Kinohalle concerts were eventually organized with permission from the camp command. Most were held on Sundays, after evening roll call. At least eight complete programs for these concerts survive. 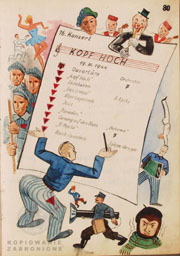 The Kinohalle concert programs were arranged to feature as many national groups as possible, but Germans, Czechs, Poles and Russians tended to dominate. By the end of January 1944, the ICC had taken over the organization of the concerts in order to ensure that themes of solidarity were regularly a part of the programs and that they were easily understandable through music, gesture, mime, and clear-cut character types. 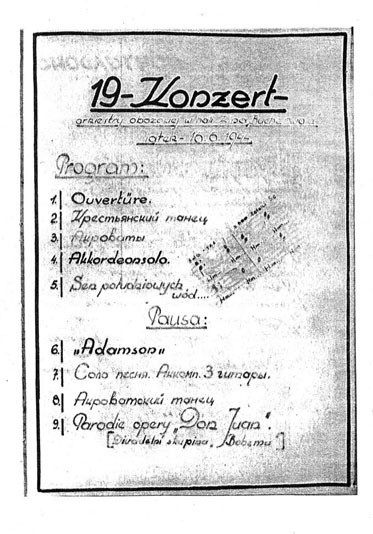 To give a sense of what these concerts were like, here is the program for Kinohalle concert number 16, held on March 19, 1944, recorded in Kazimierz Tyminski's camp diary, now housed in the Collections of the Auschwitz Museum. At left are red triangles indicating the status of political prisoner, with letters indicating nationality. Among the offerings that day were: an overture by the camp orchestra; a performance by Russian acrobats; a monologue by Bruno Apitz; old camp songs (likely communist); jazz by the Czech jazz orchestra; "Parodies" by a French group; Czech songs performed by the group "Bohema;" the circus skit "Musik-Exzentrik," featuring Nikiforov and other Soviet POWs; and Kropiński's "grotesque" march, "O Pepita," performed by the Polish group "The Seven," with interpretive dance by Targalski. Tyminski humorously writes that "O Pepita" was so popular it was subsequently performed "about 8,758 times." 10 Extremely popular, too, was "Kopf hoch," the march from which the program gets its title. With Apitz's multilingual text encouraging comrades to persevere  heads held high  and Kropiński's defiantly jaunty tune, it immediately became a hit and was widely sung among inmates. 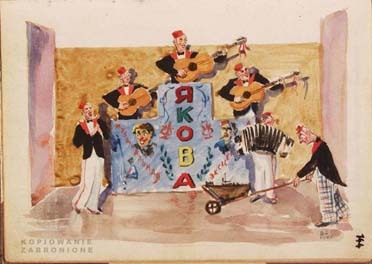 Image: Watercolor by Valentin Jermakowicz of Jokov the clown's closing act. 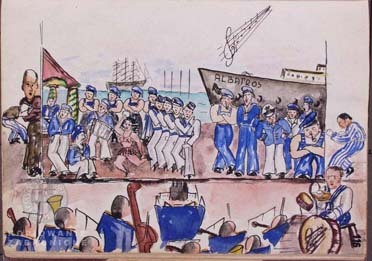 If pieces such as Kropiński's "O Pepita" and "Kopf hoch" raised prisoners' spirits, it was the skit "Dream of Southern Seas" (also known as "Five from the Albatross") that went down in camp history. 11 It premiered on June 16, 1944 during concert number 19, just before the intermission. For some of the music for Polak's scenario Kropiński also borrowed from the Ref-Ren ballad  as well as from a 19th-century Polish sailors' song, "Choć burza huczy wkoło nas" (Though the storm roars around us)  but for this "Hawaiian" dance he composed his own orchestral work titled "Utwor characterystyczny" (Character piece). Leaving aside for the moment the work's perhaps problematic juxtaposition of stereortypical Western musical folk tropes  static harmony and rhythmic ostinato in the bass, repeating melodic fragments  with the image of a Polynesian belly dancer in drag, we have here a rather fine piece of popular musical exoticism, which Kropiński turned out in just over an hour. During this busiest season of cultural offerings at Buchenwald, the camp faced its most hideous overcrowding as other camps further east were evacuated to the west. Buchenwald's inmates experienced illness and a hunger that was new to even the most seasoned of prisoners. Yet a network of well-placed inmates safe-guarded at their own peril the lives of talented, generous-spirited men like Kropiński, to ensure their continued artistic creativity. As strange as it may sound, circumstances at that particular moment in time had created a perfect convergence, an "ideal" setting in which inmates readily found opportunities to create deep bonds of friendship and trust. Kropiński was evacuated from Buchenwald on April 10, 1945, and endured a so-called "death march" before being liberated by US Armed Forces on April 24. Abandoning the camp, he took with him his violin and as many compositions as he could. By his own tally (made eight months before his death, in 1970) he returned to Bydgoszcz having salvaged 117 original compositions. The scores to his opera and several other compositions were sacrificed along the way, to build a fire to keep fellow prisoners warm. After the war, Kropiński never composed again. In part this was because he could not secure a professional music post without a conservatory diploma. Moreover, four years in the camps brought on premature heart disease and a nervous disorder that prevented him from finishing his studies while supporting a new family. Waldemar, his son, believes he had given so entirely of his creative energies in the camp that their was nothing left. But it is also possible that Kropiński felt his music simply could not be as essential as it had been in the camp. There was no longer a need to mobilize people to work together with such solidarity, no more need to lift people's spirits and to save one's own life with music. For Kropiński, the battle of Polish culture against its Nazi oppressors had already been won. Article posted March 2012. All rights reserved. Barbara Milewski is Associate Professor of Music at Swarthmore College. She earned a PhD in Musicology from Princeton University. Her research focuses on 19th- and 20th-century Polish musical nationalism, and music of the Nazi camps, and has been generously supported by fellowships and prizes awarded by the Fulbright Program, American Musicological Society, USHMM, U.S. Department of Defense, Polish Institute of Arts and Sciences of America, and Kosciuszko Foundation. In 2008, along with colleague, Bret Werb, she produced the compact disc recording, Aleksander Kulisiewicz Ballads and Broadsides: Songs from Sachsenhausen Concentration Camp 1940-1945. She is presently writing a book that explores the musical-poetic activities of prisoners in Birkenau, Sachsenhausen and Buchenwald. "Some Jewish Colleagues are Back at Their Desks…"
German-speaking musicologists in exile: Was Europe's loss America's gain? What is Internal Exile in Music?